Which Muscles of the Body Are Used While Playing Tennis? Walking into a gym full of dumbbells, barbells, racks and machines can be intimidating. While many weight machines reduce your risk of injury, are simple and straightforward to use and save you time at the gym, others offer very few benefits while sometimes causing unnecessary strain on your body. By avoiding a few bad exercise machines, you can save time at the gym while getting a safe and healthy workout. The many variations of crunch machines at the gym only add resistance to an exercise that doesn't do much to begin with. "Most of us sit in a crunched up position all day. So to go into the gym and do the same thing, but add weights to that movement is really counterintuitive," says Geralyn Coopersmith, the senior national manager in charge of staff training at Equinox Fitness, in a Newsweek article. Additionally, the movement on the ab crunch machine originates from your hip flexors, potentially causing muscle imbalances in your legs. Instead of working your abs on a crunch machine, a San Diego State University study suggests trying the bicycle maneuver on the floor or leg lifts on the Roman chair. Your body's musculature and strength are rarely symmetrical, and any machine that forces both sides of your body to work at the same resistance level, like an incline press, cable machine or lateral raise, only worsens these imbalances. By using dumbbells to perform exercises such as the shoulder press or chest press, you're allowing each side of your body to work independently at the appropriate level while engaging your core muscles for stabilization. 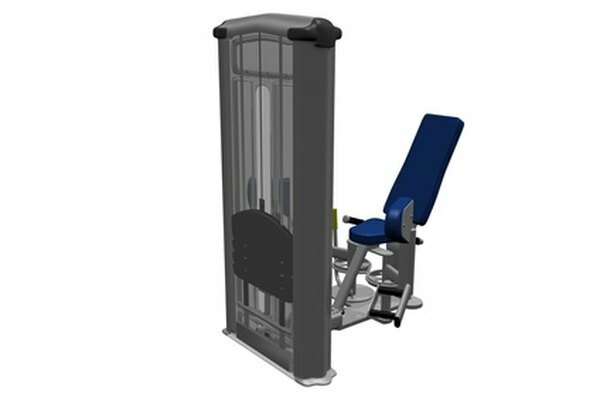 If you choose to use machines that require lifting with both sides of the body at once, look for versions that allow the handles on each side to move independently of each other. The pair of hip abductor and adductor machines found in many gyms isolate the small muscle groups on the inner and outer portion of your thighs. Many gym-goers hop on these machines in hopes of ridding their bodies of fat. Not only is spot-training for fat reduction impossible, working the abductor and adductor muscles will add bulk to your thighs instead of making them look smaller. Instead of isolating these small muscles on a machine, perform squats or lunges to get a full lower-body workout, suggests International Sports Sciences Association trainer Matt Danielsson. The myth of spot-reduction leads many fitness enthusiasts to the back extension machine in an attempt to burn away pesky love handles. This machine is one of the worst for two reasons. First, you cannot burn fat in a particular area of your body simply by working it on a machine. Second, the back extension machine mimics the motion of bending to lift a heavy object from your back instead of your knees. Save your back from potential injury by learning how to properly perform dead lifts or hyperextensions. Ask the Trainer: "Top 5 Worst Weight Machines"
Do You Do Bicycle Crunches Fast or Slowly? What Exercise Machine Works the External Obliques?